Background: Bacteria have been implicated in the pathogenesis of chronic rhinosinusitis (CRS), but their role as instigator or propagator is poorly understood. A. xylosoxidans has been rarely reported in bacterial sinus cultures in the literature, but may play a role in patients with CRS. This study aims to examine the clinical and microbiological characteristics, risk factors, and recalcitrance in patients with CRS who had Achromobacter identified by routine culture and/or molecular-based sequencing methods. Methods: Retrospective chart review was performed on all patients who had A. xylosoxidans identified by sinus cultures and/or molecular sequencing and were under care at UF Health rhinology practice between August 2013 to February 2017. Setting: Tertiary rhinology practice. Results: 18/18 CRS patients with Achromobacter identified by sinus sampling underwent previous functional endoscopic sinus surgery (FESS) (mean 2.2). These patients had undergone an average of 4.6 courses of oral antibiotics in the previous 24 months. 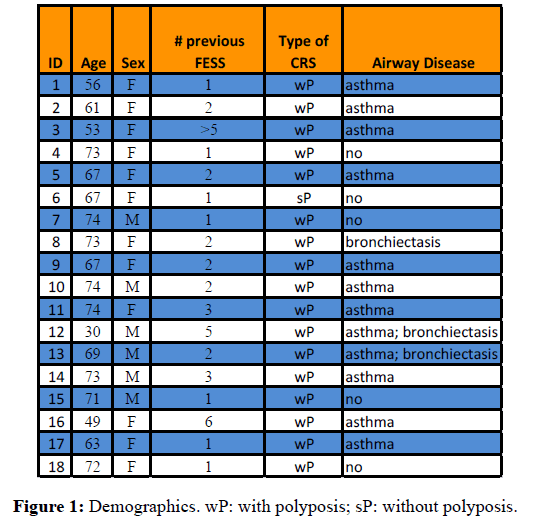 12/18 patients had asthma and 17/18 patients had CRS with polyps. 7/11 patients grew other bacteria in addition to Achromobacter on culture. A. xylosoxidans was identified by routine culture in 11 of 18 patients. Among these 11 patients, only 4 patients also had A. xylosoxidans identified by sequencing. All the Achromobacter isolates were susceptible to Trimethoprim/sulfamethoxazole (TMP/SMX) in vitro . Conclusions: To our knowledge, this is the first literature that reports the clinical characteristics of CRS patients with Achromobacter. Achromobacter infection in the sinuses may be a post-surgical disease, may have an association with airway disease, or may have an association with polymicrobial infections. Oral TMP/SMX may be an effective therapy in this patient population. Achromobacter may be a bystander or an instigator of this recalcitrant disease, and their role in CRS warrants further investigation. Chronic rhinosinusitis (CRS) affects over 30 million people in the United States and is associated with a significant reduction in quality of life . The etiology of CRS is multifactorial and a unifying cause remains elusive. Bacteria appear to play a role in CRS. However, their role as instigator versus propagator is poorly understood. Staphylococcal species and P. aeruginosa grow commonly in cultures of sinus purulence, but little is known about the prevalence and significance of less common organisms such as A. xylosoxidans. Achromobacter is an aerobic, motile, nonfermenting, gramnegative bacillus with a worldwide distribution  found in water and soil, including swimming pools, well water, dialysis and chlorhexidine solutions. They can occasionally be recovered from respiratory and gastrointestinal tracts, primarily in persons with health care contact. A. xylosoxidans is the most clinically important organism of Achromobacter species. It was first isolated from patients with chronic otitis media in 1971 , and is probably part of the endogenous microbiome of the ear and gastrointestinal tract. A. xylosoxidans is a common contaminant of fluids and has been implicated in outbreaks of nosocomial infection associated with contaminated solutions, incubators and humidifiers, and contaminated soaps and disinfectants. A wide range of clinical illnesses are caused by or have been associated with A. xylosoxidans, including bacteremia, pneumonia, peritonitis, urinary tract infection, conjunctivitis, osteomyelitis, necrotizing pancreatitis, and prosthetic valve infection [4-11]. These organisms are capable of producing and surviving within biofilms. In patients with cystic fibrosis (CF), A. xylosoxidans and other Achromobacter species have been recovered with increasing frequency from respiratory secretions, although chronic colonization with Achromobacter species have not been associated with more rapid deterioration in pulmonary functions in CF patients. In CRS, the association and role of A. xylosoxidans have not been previously reported. The purpose of this study was to examine the clinical characteristics, microbiome, risk factors, and recalcitrance in patients with CRS who had sinus secretions that were positive for A. xylosoxidans by standard microbiology culture and/or molecular sequencing. A retrospective chart review of 600 patients who were treated by the senior author at a tertiary rhinology care institution at UF Health from August 2013 to February 2017 and demonstrated A. xylosoxidans on sinus culture and/or DNA sequencing analysis was conducted. Clinic notes and operative reports were reviewed for presenting symptoms, endoscopic characteristics, interventions, and outcomes. This study was approved by the Institutional Review Board at the University of Florida. Samples were collected via standard endoscopically guided sterile brush and swab techniques per routine clinical care, and sent to UF Health microbiology laboratory for bacterial and fungal cultures and to PathoGenius laboratories (Lubbock, TX) for bacterial identification by sequencing (below). Not all patients had both routine culture and molecular assays performed. The senior author routinely took cultures of sinus purulence and sent for standard cultures, and reserved molecular testing for recalcitrant cases. Of the 19 patients with A. xylosoxidans positive culture between August 2013 and February 2017, one had a primary diagnosis of dacryocystitis and not CRS, and was thus excluded from the subsequent analysis. For molecular testing, brush and swab specimens were sent to Pathogenius Laboratory (Lubbock, TX) for processing and 16S ribosomal DNA amplification and sequencing using the Ion Torrent technology. Sequence reads were analyzed for quality and length; poor quality or inadequate length sequences were removed. Sequence data was processed and compared with 180 species in the American Type Culture Collection (ATCC) database for microbial identification. All samples were compared for read count and species identification using an analysis of variance. A total of 18 of 600 patients (0.03%) were identified with CRS and A. xylosoxidans by culture and/or sequencing between August 2013 and February 2017 (Figure 1). Mean age at the time of A. xylosoxidans identification was 64.8 years (range, 30 to 74 years). There were 6 men and 12 women. Source of the initial A. xylosoxidans positive specimen was purulent material encountered in the sinus cavities during office endoscopy (16/18 patients) or revision endoscopic sinus surgery (2/18 patients). All 18 patients had undergone functional endoscopic sinus surgery (FESS) prior to the diagnosis of A. xylosoxidans. 7 of 18 patients (38.9%) had 1 prior FESS and 11 of 18 patients (61.1%) had 2 or more procedures. On average, there were 2.2 procedures per patient prior to A. xylosoxidans diagnosis, with a range of 1 to 6 procedures. 15 of 18 patients (83.3%) had allergic rhinitis, 12 of 18 patients (66.7%) had asthma, 3 of 18 patients (16.7%) had bronchiectasis, 2 of 18 patients (11%) had both asthma and bronchiectasis, and 5 of 18 (27.8%) had immune system dysfunction (Churg-Strauss syndrome, multiple myeloma, combined variable immune deficiency, and multiple sclerosis). 17/18 patients positive for A. xylosoxidans were CRS patients with polyps; only one had CRS without polyps. Patients had received an average of 4.6 courses of oral antibiotics in the preceding 24 months (Range: 1 to 19). The full treatment regimens of prior antibiotics were unavailable for review as many patients were prescribed antibiotics prior to referral to UF Health. Figure 1: Demographics. wP: with polyposis; sP: without polyposis. A. xylosoxidans was identified by routine culture in 11 of 18 patients (Figures 2 and 3). Among these 11 patients, only 4 patients also had A. xylosoxidans identified by sequencing. Interestingly, 3 of these 4 patients showed a polymicrobial composition by sequencing, with A. xylosoxidans abundance ranging from 24% to 70% and 1 showed a 99% abundance of A. xylosoxidans. The remaining 7 patients who were positive on routine culture only for A. xylosoxidans did not undergo culture-independent analysis techniques. In 7 of 18 patients, A. xylosoxidans was identified by sequencing but not by culture (Figure 3 Panel C). Interestingly, results of the DNA sequencing analysis revealed a polymicrobial community that includes A. xylosoxidans in all cases, but routine microbiologic culture failed to identify A. xylosoxidans. A. insolitus were cultured in 2 of the 7 patients, and Pseudomonas species were cultured in 4 patients. All 18 patients received standard normal saline sinus irrigations twice per day following functional endoscopic sinus surgery. Only 5/18 patients (27%) received oral TMP/SMX antibiotic therapy. 8 of 18 patients received a different oral antibiotic. 5 of 18 patients did not receive an oral antibiotic. Figure 2: Culture & DNA results (Additional detail in Figure 3). Figure 3: Culture and DNA results. Panel A details the results for patients with culture positive results only. Panel B details the results for patients with culture and DNA positive results. Panel C details the results for patients with DNA positive results only. Available sequencing data is listed. Sensitivity data for culture results is listed in Figure 4. Figure 4: Antimicrobial sensitivities of A. xylosoxidans by subject. For the 13 patients treated with an oral antibiotic after their initial positive A. xylosoxidans event, 10 (76.9%) reported improved symptoms and 11 (84%) showed improved endoscopy findings. 5/13 (38%) patients who received oral antibiotics were treated with TMP/SMX. Of the 5 patients treated with TMP/SMX, all but one (80%) reported symptom improvement. Of the 5 patients who were not treated with oral antibiotics, 1 had a positive OR culture (subjectively and endoscopically improved at post-op appointment), 1 was allergic to sulfa drugs (stable symptoms and endoscopic exam at follow-up), 1 had previous cultures that were resistant to all oral antibiotics, and 1 was non-compliant with topical sinus rinses and was insistent on treatment with prednisone alone. All A. xylosixidans isolates that were tested against trimethoprim/sulfamethoxazole (TMP/SMX) were susceptible to trimethoprim/sulfamethoxazole (TMP/SMX). To our knowledge, this is the only series describing CRS patients with A. xylosoxidans-positive sinus samples. Previously, Aanaes et al. reported that aggressive sinus surgery can benefit cystic fibrosis patients whose sinus cultures had grown A. xylosoxidans [12,13]. However, no literature to date has examined the clinical and microbiologic characteristics of antibiotics were treated with TMP/SMX. Of the 5 patients treated with TMP/SMX, all but one (80%) reported symptom improvement. Of the 5 patients who were not treated with oral antibiotics, 1 had a positive OR culture (subjectively and endoscopically improved at post-op appointment), 1 was allergic to sulfa drugs (stable symptoms and endoscopic exam at follow-up), 1 had previous cultures that were resistant to all oral antibiotics, and 1 was non-compliant with topical sinus rinses and was insistent on treatment with prednisone alone. All A. xylosixidans isolates that were tested against trimethoprim/sulfamethoxazole (TMP/SMX) were susceptible to trimethoprim/sulfamethoxazole (TMP/SMX). CRS patients associated with A. xylosoxidans. Of note, none of the patients in the current study had cystic fibrosis. It is notable that all 18 patients had had previous functional endoscopic sinus surgery prior to identification of A. xylosoxidans. The implications of this are unknown, although A. xylosoxidans have been recovered primarily in persons with health care contact. Furthermore, the presence of A. xylosoxidans may be dependent on the culture methods as not all of our patients’ routine cultures grew A. xylosoxidans. DNA-based 16S ribosomal sequencing has only recently been applied to sinus microbiome; these techniques offer expanded possibilities for investigation, but are not currently standard of care. Our practice views them as complementary to routine culture techniques and employs the technology in recalcitrant cases of CRS. According to Lemanske and Busse, approximately 20% of CRS patients have co-morbid asthma . It is worth noting that 66% of the patients in the present study with A. xylosoxidans and CRS had asthma. While there is some selection bias as more severe cases of unified airway CRS are referred to tertiary care practices, the association between asthma, A. xylosoxidans, and CRS warrants further investigation. In the same manner, almost all of the patients in the current study had CRS with polyps vs CRS without polyps, but the significance of this is unclear currently. A. xylosoxidans has an unusual susceptibility pattern in vitro. A. xylosodians has intrinsic and acquired mechanisms for antibiotic resistance. They contain intrinsic beta-lactamases, enzymatic modification capabilities (aminoglycoside resistance), and efflux systems that increase minimum inhibitory concentrations (MICs) of cephalosporins (except cefepime), aztreonam, fluoroquinolones, chloramphenicol. Extrudes Cefepime, carbapenems, some fluoroquinolones, tetracyclines, and Erythromycin [15-23]. Suggested treatment options include piperacillin/tazobactam (Pip/Tazo), meropenem, or TMP/SMX (1st line); ceftazidime, minocycline, colistin, or chloramphenicol (2nd line); meropenem PLUS ciprofloxacin/levofloxacin (combination therapy). In the current series, no patients received IV antibiotics following the identification of A. xylosoxidans. Antimicrobial susceptibilities of A. xylosoxidans for the 18 patients are consistent with the treatment recommendations. For the initial positive culture, 9 of the 11 samples were sensitive to pip/tazo while 1 was resistant, 1 was not tested; 11 of 11 samples were sensitive to meropenem; and 10 of 11 samples were sensitive to TMP/SMX, 1 was not tested. 9 of 11 samples were sensitive to ceftazidime, 1 was intermediate, and 1 was resistant. Minocycline, colistin, and chloramphenicol were not tested. 0 of 11 were sensitive to ciprofloxacin, 6 were intermediate, and 5 were resistant. 6 of 11 were sensitive to levofloxacin, 2 were intermediate, 2 were resistant, and 1 was not tested. The management decisions regarding observation, topical saline irrigations, oral antimicrobials, and topicalantimicrobials were made on a patient-to-patient basis with consideration given to the overall health status, medication allergies, severity of CRS symptoms, severity of sinus endoscopy findings, patient ability to tolerate side effects from medical therapy, and unfortunately, patient access to certain medications from a financial standpoint. This study has several limitations. First, it was retrospective with a small sample size. Secondly, no control group was included for comparison. Finally, there was heterogeneity in the treatments regimens and diagnostic approaches for A. xylosoxidans. More research into the utility of various cultureindependent techniques is needed. The goal of this study was to provide clinical characteristics of CRS patients with A. xylosoxidans by cultures and/or molecular sequencing, and thus we could not draw any conclusions regarding the efficacy of antibiotics or procedures given the variability of treatments administered. To our knowledge, this is the first literature that examines the characteristics of patients with Achromobacter and chronic rhinosinusitis. Achromobacter infection in the sinuses may be a post-surgical disease, and TMP/SMX may be the only oral antimicrobial to which A. Xylosoxidans is consistently susceptible in vitro. The role of airway disease, association with polymicrobial infections, and the extent to which Achromobacter is an instigator of recalcitrant disease or a bystander remains unclear and warrants further investigation. Bhattacharyya N. Incremental health care utilization and expenditures for chronic rhinosinusitis in the United States. Ann Otol Rhinol Laryngol. 2011; 120: 423-27. Mandell WF, Garvey GJ, Neu HC. Achromobacter xylosoxidans bacteremia. Rev Infect Dis. 1987; 9: 1001-5. Gomez-Cerezo J, Suarez I, Rios JJ, et al. Achromobacter xylosoxidans bacteremia: A 10-year analysis of 54 cases. Eur J Clin Microbiol Infect Dis. 2003; 22: 360-63. Aisenberg G, Rolston KV, Safdar A. Bacteremia caused by Achromobacter and Alcaligenes species in 46 patients with cancer (1989-2003). Cancer. 2004; 101: 2134-40. Walsh RD, Klein NC, Cunha BA. Achromobacter xylosoxidans osteomyelitis. Clin Infect Dis . 1993; 16: 176-78. Tang S, Cheng CC, Tse KC, et al. CAPD-associated peritonitis caused by Alcaligenes xylosoxidans sp. xylosoxidans. Am J Nephrol. 2001; 21: 502-6. Castellote J, Tremosa G, Ben SL, et al. Spontaneous bacterial peritonitis due to Alcaligenes xylosoxidans. Am J Gastroenterol. 2001; 96: 1650-51. Manfredi R, Nanetti A, Ferri M, et al. Bacteremia and respiratory involvement by Alcaligenes xylosoxidans in patients infected with the human immunodeficiency virus. Eur J Clin Microbiol Infect Dis. 1997; 16: 933-38. Ridderberg W, Wang M, Nørskov-Lauritsen N. Multilocus sequence analysis of isolates of Achromobacter from patients with cystic fibrosis reveals infecting species other than Achromobacter xylosoxidans. J Clin Microbiol. 2012; 50: 2688-94. Mantovani RP, Levy CE, Yano T. A heat-stable cytotoxic factor produced by Achromobacter xylosoxidans isolated from Brazilian patients with CF is associated with in vitro increased proinflammatory cytokines. J Cyst Fibros. 2012; 11: 305-11. Ronne-Hansen C, Pressler T, Hoiby N, et al. Chronic infection with Achromobacter xylosoxidans in cystic fibrosis patients; A retrospective case control study. J Cyst Fibros. 2006; 5: 245-51. Liu L, Li Y, Li S, et al. Comparison of next-generation sequencing systems. J Biomed Biotechnol. 2012; 2012: 251364. Aanaes K, von Buchwald C, Hjuler T, et al. The effect of sinus surgery with intensive follow-up on pathogenic sinus bacteria in patients with cystic fibrosis. AM J Rhinol Allergy. 2013; 27: e1-4. Lemanske RF, Busse WW. Asthma. J Allergy Clin Immunol. 2003; 111: S502-519. Abbott IJ, Peleg AY. Stenotrophomonas, Achromobacter, and nonmeliod Burkholderia species: antimicrobial resistance and therapeutic strategies. Semin Respir Crit Care Med. 2015; 36: 99-110. Amoureux L, Bador J, Siebor E, et al. Epidemiology and resistance of Achromobacter xylosoxidans from cystic fibrosis patients in Dijon, Burgundy: First French data. J Cyst Fibros. 2013; 12: 170-76. Bador J, Amoureux L, Blanc E, et al. Innate aminoglycoside resistance of Achromobacter xylosoxidans is due to AxyXY-OprZ, an RND-type multidrug efflux pump. Antimicrob Agents Chemother. 2013; 57: 603-5. Bador J, Amoureux L, Duez JM, et al. First description of an RND-type multidrug efflux pump in Achromobacter xylosoxidans, AxyABM. Antimicrob Agents Chemother 2011; 55: 4912-14. Traglia GM, Almuzara M, Merkier AK, et al. Achromobacter xylosoxidans: an emerging pathogen carrying different elements involved in horizontal genetic transfer. Curr Microbiol 2012; 65: 673-78. Trancassini M, Iebba V, Citera N, et al. Outbreak of Achromobacter xylosoxidans in an Italian Cystic fibrosis center: Genome variability, biofilm production, antibiotic resistance, and motility in isolated strains. Front Microbiol 2014; 5: 138. Turton JF, Mustafa N, Shah J, Hampton CV, Pike R, Kenna DT. Identification of Achromobacter xylosoxidans by detection of the bla (OXA-114-like) gene intrinsic in this species. Diagn Microbiol Infect Dis 2011; 70: 408-11. Yabuuchi E, Oyama A. Achromobacter xylosoxidans n sp. from human ear discharge. Jpn J Microbiol. 1971; 15: 477-481. Solyar A, Lee A, Przbyszewski B, et al. Atypical mycobacterium detection in refractory chronic rhinosinusitis. Otolaryngol Head Neck Surg. 2012; 146: 1012-16.